The name, Punta Gorda, comes from the Spanish, meaning Fat Point. This historic small town is a hidden treasure of Florida sticking out into Charlotte Harbor – one of the US’s largest natural harbors. Here in Punta Gorda, you'll enjoy some of the best sunsets that Florida has to offer, an amazing waterfront, a diversity of places of interest to visit and shop, and a vibrant real-estate market. Punta Gorda is the only incorporated city of Charlotte County, Florida. It boasts wonderful restaurants, marinas, numerous cycle treks around this cycle-friendly city, and a pace of life that people from around the world come to enjoy. Centrally located between Sarasota to its North and Fort Myers to its South, Punta Gorda is in a delightful location, within a comfortable driving distance from Tampa, Orlando and Miami. Punta Gorda is also home to The Charlotte County campus of Edison State College, which has four campuses in southwest Florida. The city of Punta Gorda offers a Mural Tour and a Waterfront Walking Tour. Residents can enjoy 15 parks totaling approximately 82 acres. All of these parks have a combination of facilities and amenities for public use, some including boat ramps, piers, observation decks, nature walks, wetlands, beaches and picnic tables. 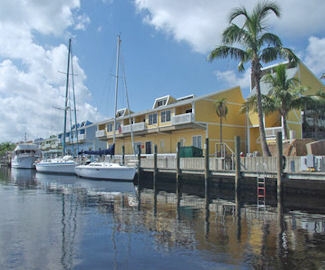 The City of Punta Gorda proudly opened the Laishley Marina is located in Laishley Park on the shoreline of Charlotte Harbor and the Peace River. Charlotte Harbor, the second largest harbor in the State of Florida, offers world-class fishing and access into the Gulf of Mexico at the vicinity of Boca Grande. To learn more, visit The city of Punta Gorda website. Blue Heron Pines 55+ Golf Course Community is a 140-acre community enhanced by the rolling fairways of a scenic 18-hole golf course sure to please golfers of all levels. Tree-lined streets wind through the community, and private lakes offer plenty of places for catch-and-release fishing. 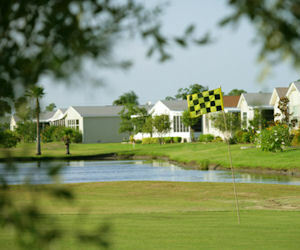 Blue Heron Pines offers a quiet, country club atmosphere and a 9,000 sq ft. lakefront clubhouse with patio deck. Resort-style amenities and activities include: 18-hole executive golf course and aqua driving range, a pro shop and snack bar with patio deck, a heated swimming pool and sundeck, a state-of-the-art fitness center and sauna, and Boat and RV storage. According to the U.S. Census Bureau estimates of 2007, the city had a population of 16,762. Punta Gorda is the principal city of the Punta Gorda, Florida Metropolitan Statistical Area and of Sarasota-Bradenton-Punta Gorda Combined Statistical Area. As of the census of 2000, there were 14,344 people, 7,165 households, and 5,187 families residing in the city. The population density was 1,012.8 per square mile. There were 8,907 housing units at an average density of 628.9 per square mile. The median income for a household in the city was $48,916, and the median income for a family was $54,879. Information from Wikipedia. Punta Gorda Farmers Market is voted the best small market in Florida and 15th in the USA. It has a large number of vendors offering fruits and vegetables, Italian bakery, fresh homemade pasta, beef and fresh seafood, Florida arts and crafts, cheese, organic produce, and more. The Farmers Market has become a Saturday morning tradition and offers live entertainment. The Annual Wine & Jazz Festival event is always a great day of excellent food, drink and entertainment in one of the most beautiful settings in the area. Local restaurants offer samplings of their fare, and you can enjoy wine distributors from around the world. Downtown's unique old-Florida architecture is what draws most visitors to its quaint, cobbled streets. Once you get here, you soon realize that there is a myriad of unique shops and restaurants to visit with many old buildings being restored to accommodate art galleries, boutiques, and restaurants. Fishermen's Village is a fully-restored waterfront mall and marina with exclusive boutiques, shops and fine restaurants, offering great views over the harbor. There is also daily nightlife with something different happening every day. From Fishermen's Village you can enjoy sight-seeing cruises, go fishing, hire your own boat to explore the harbor or go jet-skiing. The Babcock Ranch and Wildlife Park - one of the largest undeveloped expanses of pine flatwoods in Southwest Florida and a favored spot for horseback riding and pure nature enthusiasts. Other attraction include the Visual Arts Center, the Military Heritage Museum, Muscle Car City, the Pottery Express/Bamboo Farm in South Punta Gorda, the Peace River Wildlife Center and the Charlotte Harbor Environmental Centre. The above information can be found at the Punta Gorda Chamber of Commerce website. For more things to do in Punta Gorda visit puntagordashopping.com.